What does a Strike Off Company Imply? In layman’s language, strike off means “sudden attack”. But for us, it means temporary removal of the name of the company from ROC i.e. the company obtains the status of being dormant. Earlier section 560 of Companies Act 1956 used to deal with such issues but from June 2017, Section 248 of Companies Act 2013 deals with striking off defunct companies off the register (an alternative to the winding up of the company). However, the remedy is available in form of section 252 of the Companies Act 2013, which provides such aggrieved companies a chance to restore themselves. The one those have failed to commence its business within a year of its incorporation. Registrar of Companies or ROC is the one who has all the authority to strike off not only defunct companies but also even those companies which have failed to do all their statutory filings. The Registrar not only issued served notice mandated by law to all such companies but also subsequently struck off. 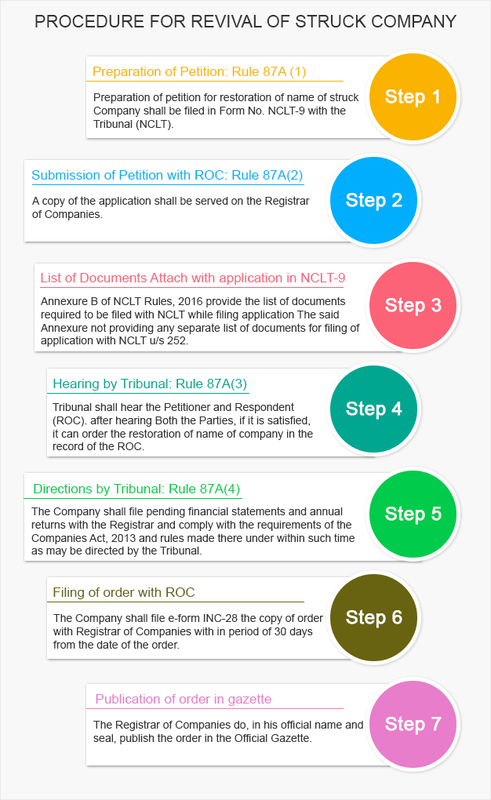 Filing of application: As per NCLT rules under section 252(1) and 252(3), an application shall be filed before the Tribunal along with other necessary information. Service of Application: A copy of application shall be forwarded to the Registrar by the company. Passing of Order: Once the hearing of the application in which both the parties will present their points, the Tribunal may pass on order, as deems fit. Filing with ROC: After satisfaction of the Tribunal, the applicant will have to deliver a certified copy to the ROC within 30 days of the date of order in INC 28 along with pending financial statements and annual returns. Order in Gazette: Once the copy is received, ROC will publish the order in Official Gazette in company’s official name and seal. As all ROC’s has issued show cause notices to the Companies fallen u/s 248(1) (c). In notice ROC mentioned that it can strike off Company if appropriate reply not filed within 30 days and ROC will take appropriate action against the Directors. After that at the end of the June, 2017 ROC has struck off the 100,000 (One Lakh) Companies from its record. To strengthen the norms of Corporate Governance. “It could be seen as a farsighted move where the government could distinguish between companies that are black and those that are in grey”.